This vinyl LP has a very limited pressing of just 1,500 copies. "Fans always wonder what it is I do between E Street Band tours," Garry Tallent tells Backstreets. "This is my answer!" The aptly named Break Time is the Rock and Roll Hall of Famer and E Street bassist's first solo album, on the label he co-owns, D'Ville Record Group. Garry sings, Garry writes, plays guitar and more, and the record is a hell of a lot of fun. 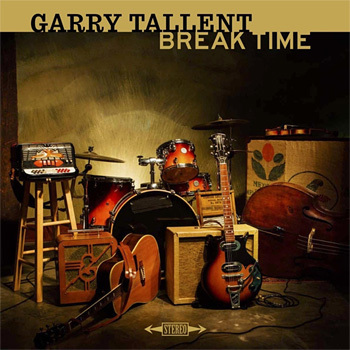 Initially available only on vinyl and digital download (a CD edition is coming May 27), Break Time debuts Garry's deeply personal and vibrant take on American rock 'n' roll in all its forms, from Cajun to honky-tonk, rockabilly, and rhythm and blues. "They're my songs," he tells us, "and I chose the ones that fit the mold of the album that I was trying to do, which is my tribute to the '50s. That's always been my favorite era of music." Garry qualifies, "It's not a Bruce Springsteen record," and from Chuck Berry to Buddy Holly to Lee Dorsey, Break Time has Garry wearing his '50s and '60s influences on his sleeve. Recorded live to 8-track tape in Nashville at Paul Burch's Pan American Sound, the album was arranged on the spot, and Break Time's three-dimensional sound is just what you would expect from an artist who knows that great rock 'n' roll is part sonic and part soul. Having opened Moon Dog Studios in Nashville in the '90s, Garry is also revered as an exceptional producer and contributor to great hits like Gary U.S. Bonds, Southside Johnny, Steve Earle, and Robert Earl Keen, who have all tapped Tallent's ear and bass playing to make sonic alchemy happen in the studio. And now it's his own turn. Co-produced by Tallent, the album showcases not only his superb songwriting -- long admired by his peers but seldom in the spotlight -- but also his gift for bringing together players who have the perfect combination of craft and soul. Garry's crack Nashville band includes co-producer and Los Straitjackets guitarist Eddie Angel, Johnny Cash's bassist Davie Roe, and master instrumentalist Fats Kaplin (Jack White, Beck); the album also features a few special guests, like Nils Lofgren singing harmonies on "Ooh La La," Doug Kershaw on "Bayou Love," Duane Eddy twanging it up on guitar on "Promise to My Heart," and Kristi Rose, who duets with Garry on the lead single "Stay Away," which he wrote with Southside Johnny Lyon. Only 1,500 copies of this album are being pressed on vinyl. The songs are also available for digital download, included free with this record, or available as a separate digital purchase from online music download stores.